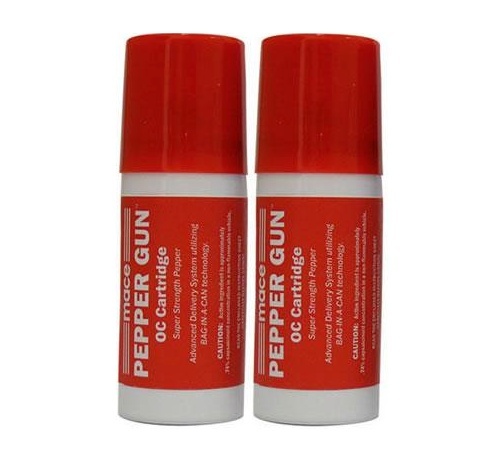 MACE® Pepper Gun Refill Cartridges Pack includes Two 28 gram OC Pepper Cartridges with powerful Oleoresin Capsicum (OC) pepper formula utilizing patented Bag-in-a-Can™ Technology. This system allows the pepper spray to spray like an aerosol in a continuous fashion from any angle, even when the Pepper Gun is held upside down. The OC super strength pepper spray formula (.74 Capsaicinoids) is contained in a disposable cartridge that fires up to 7 times in rapid succession and can then be quickly reloaded when empty. The weapon is made of rugged metal construction and reloads like a breach loading shotgun. The cartridge sprays a constant stream, reaching up to 25 feet, from any angle including upside down. Other pepper sprays have a range of only 8 to 12 feet. The Pepper Gun shoots a solid stream in a long straight line effective even in a stong wind.